For great fun in the garden - no matter what the weather is like outdoors! Evi's Garden A Steffi Love Play Set, by Simba. Evi is Steffi Love's cute little sister. She digs, cuts, waters, shovels and maintains her garden to make the flower beds and pots burst into bloom and keep them free from weeds. 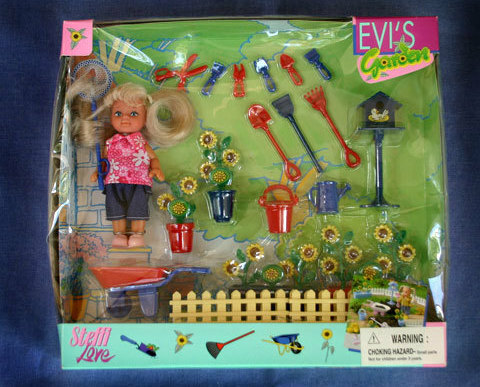 This play set contains one Evi doll, one butterfly net, six hand tools, one garden rake, two long handled shovels, a wheelbarrow, a birdhouse, four bright yellow picked fences, two vining pots, two planters and two watering cans. New!